On the island of Don Det there is a guesthouse that has two really nice sized western pools. Around the pool are tables and comfortable sun loungers to relax; included in the price is a towel. The guesthouse has a swimming pool bar and a restaurant facing the river, so you can lie around all day without having to leave for lunch, drinks or snacks. You can find Long Island Guesthouse near the French bridge – when coming from Don Khon, go straight for a 100 meters or so and turn left after the market stalls. Li Phi is probably the most amazing waterfall I have ever seen, it’s so big it doesn’t fit in a photograph. There’s a restaurant with huts, a shower and a sandy beach, only to sunbath because the water from the waterfalls is incredibly fast and it’s too dangerous to swim. The waterfall can easily be reached by bike from Don Det; simply cross the bridge between Don Det and Don Khon and turn right at the locomotive, there you will find a sign to the waterfall. Follow the road for another two kilometres until you find the entrance to the waterfalls. The islands are pretty small – in the heat it’s ideal to have a bike to get around or to another island. Bikes can be rented everywhere around the island for 10.000 kip a day. However, be sure to check if the bike is fully functional, the roads are pretty bad (not paved and full of potholes) so you don’t want your bike chain to fall off or tire to go flat when going over the first bump. The Mekong looks clean and very inviting on a hot day and all the locals bath in the Mekong at dusk. There are numerous places near guesthouses where you can safely enter the water and take a dip. Getting up early is really worth it to be able to see the incredible sunrises and taking pictures of the Lao fishermen casting their nets over the Mekong. But if getting up early isn’t your thing you could always wait until the sun goes down while drinking a Lao beer somewhere along the Mekong to see the skies turn orange. We stayed at Mr Tho’s who has simple wooden huts with hammocks in front of them looking out over the Mekong. You can’t really get more relaxed than swinging in your hammock and reading a book or simply spend your time watching Lao children go to school in their canoes, or the fisherman casting their nets. The beach on Don Khon is a huge sandbank on the Mekong which looks like a beach and has some small restaurants for a meal, drink or snack. It’s a great place to relax and has a small hill with trees and shade as well if you don’t want to get a sunburn. It’s really quiet with just a few other tourists, so you have most of the beach to yourself. The beach is located at the south west end of Don Khon. If you know how to ride a motorcycle and have a couple of days I highly recommend the southern swing. It’s an incredible two to four day loop on the plateau visiting gorgeous waterfalls and coffee plantations. See my blog about the Bolave for more information. If you aren’t into motorcycles, but do want to see some of the waterfalls from the southern swing Tad Lo is one of the ones not to miss. You can get there by bus and even stay the night in one of the many guesthouses (be sure the book a room before you go, when we were there in January everything was full). The waterfall is not only extremely pretty but nice to swim in as well. Once you are done swimming Sabaidee guesthouse has really nice cocktails and a small menu with proper western and Lao food, with a small garden with nice relaxing huts and tables to sit. Across the bridge from Pakse in the mountains you will see a golden buddha watching over Pakse. You can climb an incredible number of stairs, but you can also take a twenty minute motorbike ride up the mountain – you’ll see a lot of locals going up as exercise. The views are incredible and around sundown you will be joined by young Lao people who come here to enjoy the views as well. There is a really nice floating restaurant at the Mekong which gives you incredible views of the sundown over de Karst mountains across from Pakse. They serve ice cold Lao beers to go with that gorgeous view. Reading about Champasak I didn’t realize how incredible this site is. Having been to Ankor wht we didn’t expect to be wowed, but boy were we. The site is gorgeous, the staircase going up the mountain is ringed with lotus trees, not only giving off an incredibly sweet smell while you climb up, but giving beautiful views up and down. Once you have climbed up all those stairs you are rewarded with an incredibly view over the valley. This was one of my favorite days in Laos. Be sure to visit a coffee plantation while staying in Pakse. We visited Sinouk (http://sinoukcoffeeresort.com/) while on the southern swing and had an amazing breakfast there. The gardens are gorgeous with butterflies flying around and really nice to go for a walk around after breakfast, lunch or just a cup of coffee. Pretty much the only reason to come to Tha Khaek is to do “the loop”, a 500+ kilometer motorcycle loop through the Laos countryside. It was one of the highlights of our trip and I would definitely recommend it to you. Read up on my detailed blog about the loop. 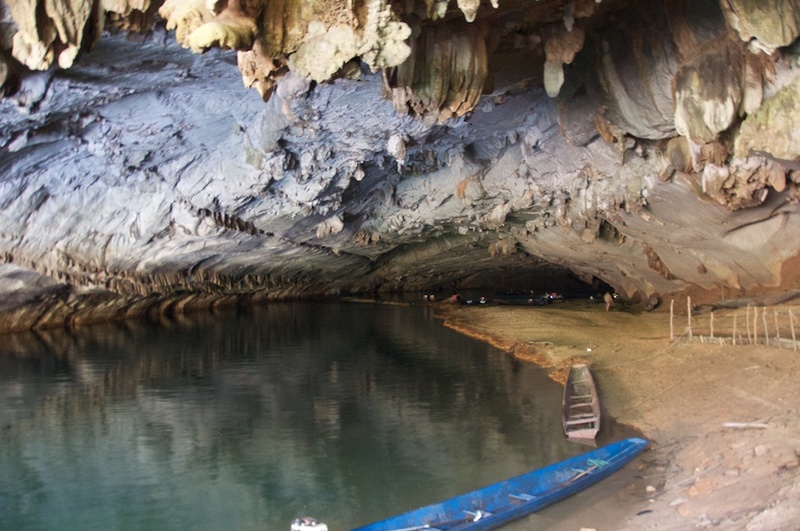 This amazing seven kilometer (yes it’s really that long) is mind blowing, you travel through a huge Karst mountain ridge with a wooden boat. The caverns in the cave are high and some as big as football fields. Unfortunately it’s pitch dark so impossible to take proper pictures from the boat, so you have to just trust me. Every night is market time on the boulevard of Vientiane; hundreds of food, clothes, gadget, toy, electronic and souvenir stalls set up around 5 p.m. It’s great fun to walk past the stalls and check out all the merchandise, pick up an inexpensive t-shirt, or simply spent your time watching people. When we were in Vientiane it was incredible cold and raining, so we were constantly looking for shelter. The bowling alley was great, also an escape from the sun on better days. It’s a really old bowling alley with wobbly floors – but great fun to throw some balls. We found this cafe while looking for a place our toddler Noa could play. It’s a western owned cafe with great food, coffee (made by real barista’s), wifi, lots of relaxing space to sit and an inside and outside shaded playground for children. If you are not into children, no worries, the cafe allows you sit without being bothered by children if you want some quiet time. Museum with a good display and a lot of information on the US bombings on Laos and the effects of them today. 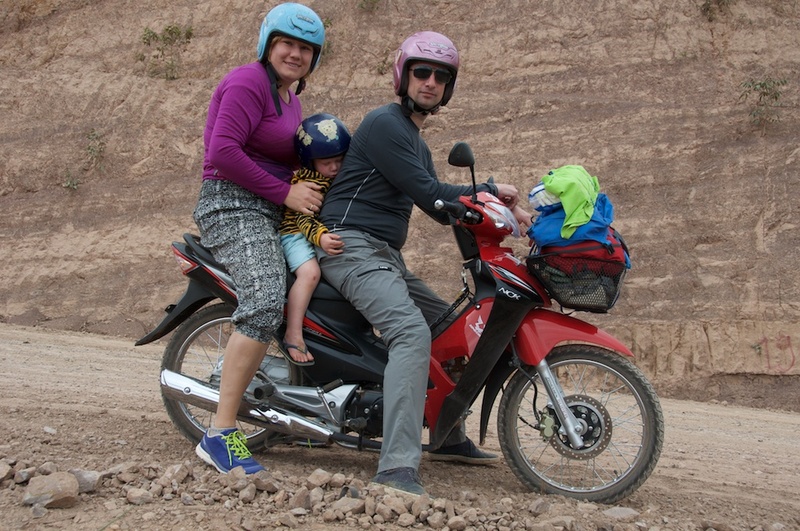 There is a great deal of information on how the organization helps people throughout Laos. But also tips on how you recognise souvenirs made from scrap metal, this way you can avoid buying them and discourage people from looking for scrap metal. Si Saket is one of the oldest temples in Vientiane; the walls of the temple are filled with thousands and thousands of buddha statues. When we were there we saw numerous couples getting there wedding pictures taken. It was definitely a bonus to see the Lao couples dressed up in their gorgeous wedding costumes. This incredible golden stupa is even more spectaculair in real life. Next to the stupa area is another temple with a lying buddha, numerous interesting paintings and a big modern temple. Definitely worth to take a look around. Away from all the tourists is an incredible viewpoint, just outside of Vang Vieng. The climb up is very, very steep and takes some determination but you will be rewarded with incredible views of the Karst mountains and valley. Tip: don’t stop at the first hut, but keep going all the way up the Karst mountain at the back. Finding the entrance should be easy with tourist maps available showing the viewpoint and road signs on the right hand side of the road away from Vang Vieng doing the small loop of Vang Vieng. Without a doubt the nicest guesthouse we stayed in all of Laos. Next to a welcoming restaurant with an extensive menu with good food, drinks and snacks, there are gorgeous gardens. Across a bridge are big relaxing daybeds to enjoy the Karst mountain views and hundreds of butterflies flying around in the garden. Oh and did I mention the rooms are big, clean and cheap? There is a public swimming pool in Luang Prabang which is really nice, especially to eascape the heat and cool down. The swimming pool is surrounded with daybeds, tables and chairs for you to relax in. There are signs everywhere around town for Pistoche pool, or check out their website. A great way to spend the day is to walk up to Phou Si, a temple and viewpoint with far reaching views across the town and beyond. We enjoyed going up at the south side, where the climb up seems less steep and there’s more to see than the other stairways. We had the most wonderful hotpot at the Diyen Sabai restaurant, just across the bamboo bridge. It’s a lovely restaurant with nice sitting areas to relax. The hot pot is incredible, your table is turned into a barbecue where they place a small pot barbecue. On top, in the coconut broth, you can boil eggs, vegetables and noodles, while you barbecue is a choice of chicken, buffalo and/or fish on the pot barbecue hmmmmm. Taking a river cruise down the Mekong is one of those experiences not to miss. We took the luxery Shompoo boat which is unbelievably nice with a sundeck, loungechairs, a great breakfast and two stops along the way at the Buddha Cave and a village. The cruise is two days, half way you stay the night at a small village called Pak Beng. Not every national park in Laos is easy to reach, or easy to arrange a trek, but this one is. We went to the village Vieng Phoeka and arranged a trek from there, but it’s also possible to do this from Luang Nam Tha. 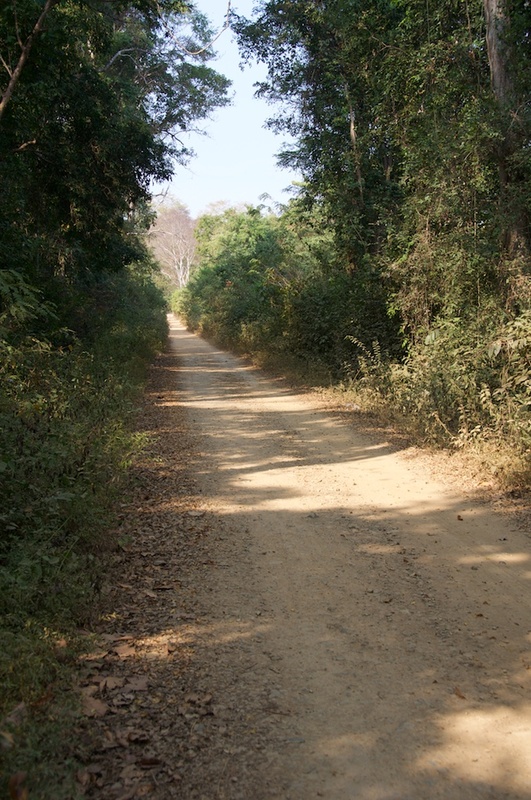 The one day trek was amazing, we were picked up by our guide Noi and taken to a village from which we started the trek. Noi and the guide from our village gathered food along the trek and made an amazing lunch for us with all the local ingredients. After that we spend the afternoon exploring a cave before taken back to our guesthouse. 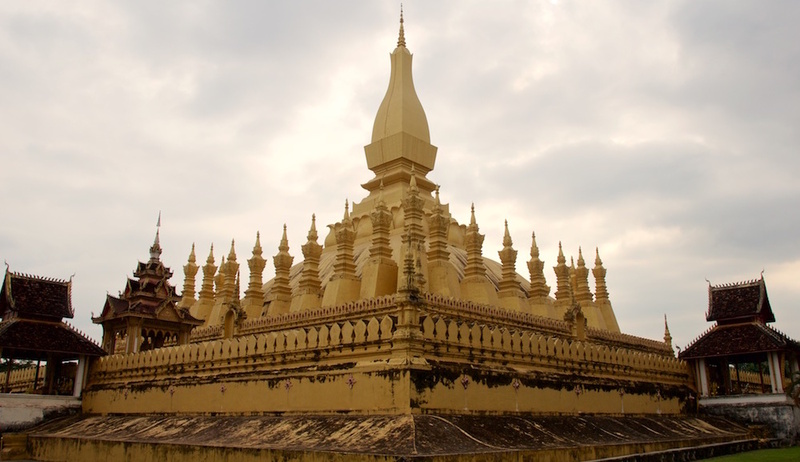 Check out my blogs on Laos or photo albums of Laos as well. If you see anything that you want to know more about, don’t hesitate to contact me via Twitter, or drop us a note underneath the blog or the photo you have a question about.